People are paying increasing attention to their health and the intake of natural, toxin-free, organic food. To stay healthy, many people are willing to spend a little more on organic food. But in addition to healthy and safe food, breathing healthy air deserves our attention too! Harmful Total Volatile Organic Compounds (TVOC) lurks in every corner of our homes. Even many products we use daily around the house, such as skin care products, cosmetics, styling gels, and cleaning agents may also contain high concentrations of VOCs. The harm from long-term exposure to these should not be underestimated. Especially pregnant women, children, the elderly, and those suffering from respiratory or heart diseases, are especially vulnerable to poisoning by indoor air pollution, and they should pay extra attention to the quality of the air around them and stay away from contaminated air as much as possible. The most common indoor air pollution stems from housing decorations and remodeling, which may release VOCs from paint, adhesives, wood, plywood and other materials. As most people are not quite aware of these sources of indoor air pollution, people may move in too early when the harmful TVOC have not yet been removed by ventilation, and may experience physical discomfort as a result. To leave TVOC no escape, the KINGMAX team checked a new home using the “AirQ Check - TVOC Mobile Health Device” The test found that the tailor-made wooden cabinets emitted TVOC concentrations greater than 1000 ppb, while the system cabinets released 200-400 ppb. Thus when remodeling one’s home, it is worthwhile to pay close attention to changes in the concentration of harmful gases, and take precautionary measures until these volatile gases have sufficiently dissipated. 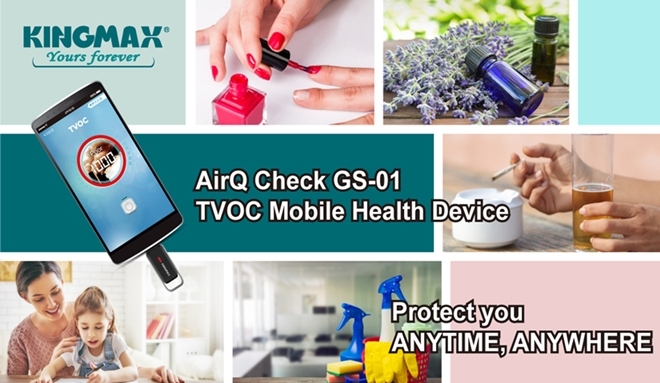 If you also want to monitor and control the concentration of TVOC in your home, then the “AirQ Check - TVOC Mobile Health Device” (air quality monitor) offers a quick and easy way. It enables you to instantly monitor TVOC in your indoor environment, and take measures to eliminate any indoor air pollution you may find!